My husband doesn’t get Pinterest. I showed him Albany Kid’s family travel boards, and even shared my roundup of Pinterest tutorials, but he still wants to know what it is and what’s in it for him. 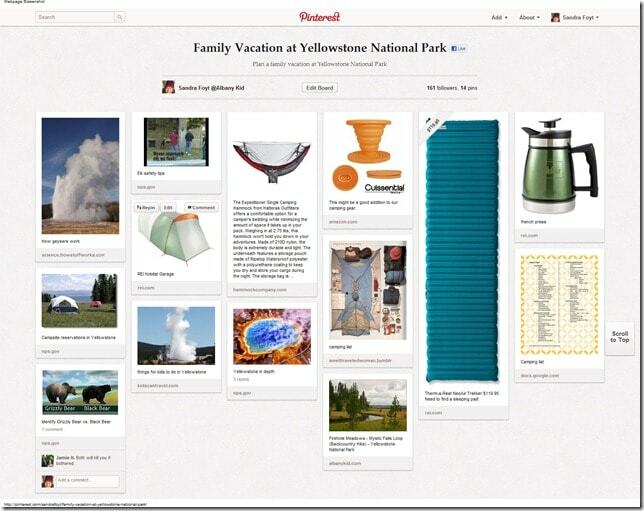 In simple terms that even my husband can understand, Pinterest lets you make pinboards online. One popular way to use Pinterest is for travel inspiration. The would-be traveler sets up a pinboard and gives it a title such as, “Places To Go When My Ship Comes In,” and then looks for images to put on that board. The problem with this approach is that it’s a little overwhelming and it only gets worse if you try to look at everything. 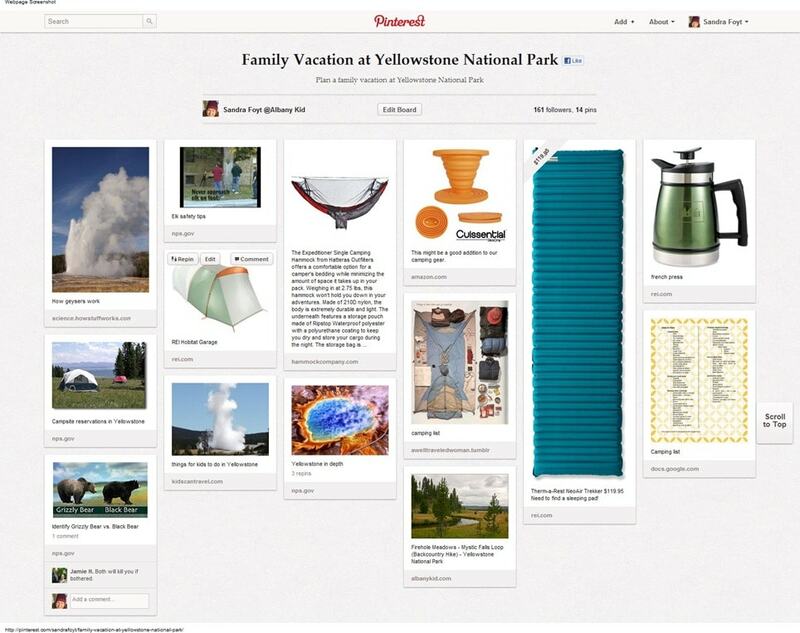 Say you’re inspired to go to Yellowstone National Park this summer, how do you use Pinterest to plan the trip? It’s easy to add them to your board, as you can repin these or any other pins you find on Pinterest onto your board. By now you might be thinking of turning your vacation into a camping trip. 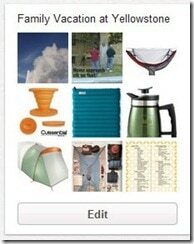 Try searching for “camping list” and you will find many, many great camping list pins on Pinterest. Repin the best on your board. But that’s not all. Just about any image you find anywhere online can be pinned to your board. 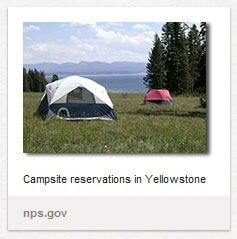 You might, for example, pin the image associated with Campsite Reservations. 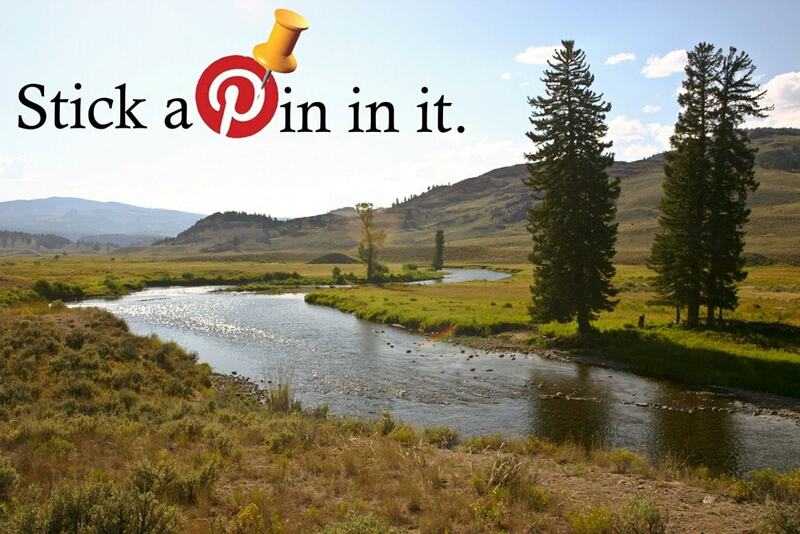 But it almost doesn’t matter which image you choose, when you click on that pin on your board, it will bring you back to the Campgrounds in Yellowstone page on the website. But wait, there’s more. Using “Add+” you can upload any image on your computer! So now, when you make your packing list, you could include images of your own gear, outfits, whatever. Imagine knowing at a glance what’s stored in the attic. Won’t that make it much easier to pack for a camping trip, or to make a shopping list for missing items? Someday, I imagine that it will be possible to use the Pinterest navigation pane to shop for camping gear that has been sorted by price and category. Right now, there is the option to look at items under the “Gifts” tab that have been sorted by price. But that brings up any pin that has been tagged with a price. Alternatively, plug in the item you’re looing for – sleeping bags, tents, backpacks, to name a few. I expect that most major brands will be on Pinterest shortly, and wouldn’t be surprised to see shopping on Pinterest options change soon. What if you decide that you Family Vacation at Yellowstone National Park is a perfect opportunity for a family reunion? This is where Pinterest gets really interesting because you can set up collaborative boards. 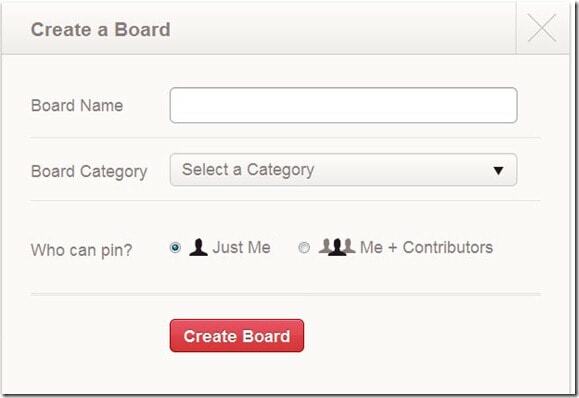 When you set up a pinboard, you can select to add contributors (just make sure that they follow you first.) Now you and anyone you designate can help find and pin the best deals, tips, and resources for your trip. So far, we have created a “Family Vacation at Yellowstone National Park” board, added travel planning and shopping content, and invited the rest of the extended family to collaborate. What else can you do? Well, you might want to create separate boards for pre-trip education on subjects like plant or animal identification. 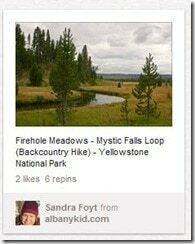 Add in images and videos, found either already in Pinterest under categories like “Education” or “Videos.” Or add in items found online such as the National Park Service’s Yellowstone InDepth Series or How Do Geysers Work? from How Stuff Works. Think about what you might want to know before you go, and pin it. Using Pinterest for entertainment is almost inevitable. Follow a few folks, and before you know it you will be bombarded with funny posters and videos. Head to any of a number of categories on Pinterest – Humor, Technology, Videos, and many more – and you will be surprised at how fast time flies. If you need more travel entertainment, visit the Travel Channel. But watch out, Pinterest is addictive! Nice meeting on PinChat Sandra. I pinned this article and the Journey Mom article it links to. My comment over on Journey Mom is probably stuck because I put 2 links – one to the pin and one to this article. Can you please take a look. Interesting… I haven’t gotten into Pinterest as I never really saw the point. Even my sister-in-law, who is a Pinterest addict, tried to disuade me from it… Glad it’s got some good uses! Well, Aaron, I’m just getting started. I could write another post – and I will! – on the many ways that I’m using Pinterest for travel blogging, but it’s just a tool. It happens that this particular tool appeals to me, allowing me to do what I want to do, but it’s not for everyone. Hmm… I think that’s what I said about Twitter back in 2008. Hi Sandra. Just to let you know that I found your post extremely useful. As a UK tour operator, we’ve just started using Pinterest this week and looking to educate our Facebook fans on the concept. 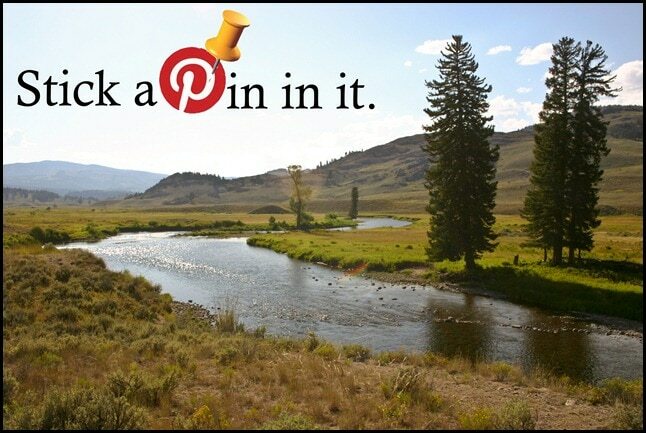 So, have posted your blog to our FB page ‘TropicalSky’ as a way of explaining how users can engage with Pinterest. Best regards. I am totally clueless about Pinterest and am excited to learn about it and how I can use it..
I’m just getting started playing around with Pinterest. I see it is great eye candy and inspiration, but this shows me it can be much more practical. I look forward to using it for trip planning. Thanks for the tips!